There is nothing ordinary about us. In fact, we have gotten use to being 180° from ordinary. We just seem to stumble on things in life. Situations, things and unusual people are just the norm for us. Last week, we went to our favorite bakery in Nye Beach Oregon. There was Panini Joe and the usual unusual crowd was there. The pirate, coffee thief, Goth girl… you know the regulars. Nye Beach is very different from Newport. Newport is a drinking town with a fishing problem. Nye is the beach community that when you leave Newport to drive to Nye, it is not only about a mile from downtown, but you travel back in time to about 1975. Rustic beach homes and businesses and a crowd of people that resemble a Vermont commune more than the hippie community that you would expect. My God, they even have a place called the Café Mundo that plays folk music and has author readings from the likes of a guy named Matt Love. After an outstanding bread pudding and Italian coffee at Panini Joe’s, we decided to walk on Nye Beach. It was a gorgeous morning, sunny and clear. The week prior was drizzly, cool and foggy. In fact, this was the first really nice day in two weeks and it was unusual to see the beach bright and clear. Work would wait an hour as we felt this might be the only sunny morning on Nye Beach. We were a week away from leaving and the sunny beach took priority today. As we walked down to the Nye common, we noticed a large number of people. Then as we turned toward the beach, the dunes that were typically smooth and wind driven were flattened by what looked like thousands of footprints. As our eye peered upward, there is was! An 80’ tuna boat washed up on the beach! Okay, we thought, it was a little unusual to see this fishing boat beached and listing on it port side. 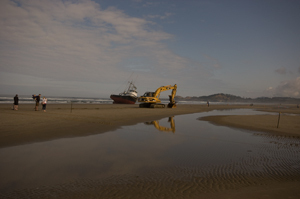 Flanking the boat was a couple of Caterpillar dozers, a steam shovel, a bunch of trucks, a 1964 Huey helicopter and most of Nye Beach’s residence. This was a happening at Nye, so we joined in as if we were just a couple of locals down watching this news worthy event. We spent a few hours hanging around talking to some of the locals and learning their life’s stories. An old guy named Tom who lived up on the bluff used to own a chain of truck stops told us about the gas crisis in the 70’s and how he sold his stores to retire in Nye. Now he lives in his bluff house that he raised one story so he could see the ocean, runs a 14 unit apartment building that he owns and aspires to commute to Honduras to harvest mahogany wood stumps left by the British. Then there was Sean the chopper pilot. We talked to him quite a while about his Vietnam vintage Huey helicopter and the plan. It was Sean’s job to hoist a thin Kevlar line up in the air. Attached was a 4” braided main line. His job is to lift the light line high and then fly it out to a tug that was waiting. This was not just any tug, but one that weighs 190,000 pounds and will pull the Little Linda apart or off the beach. No one was quite sure how the old boat would fare. So Sean lifted the light line and flew it out to the tug dragging it over the stern to be caught by the crew. We met another gal who came down from Portland and proudly displayed her Goodwill clothing. It seems as though it is the in thing for Oregonians to dress hippie sheik at the lowest possible cost. It is a very common conversation opener around friends to hear them talk about their clothing and how much it cost. Great jacket! Yeah I got it at Beavers for 50 cents. Just in Nye Beach alone, there are probably 5 second hand stores. In all of Newport, they probably total more than 20. She was bummed because the pull would not happen until high tide which would be at about 6 pm. She had to go back to Portland for a meeting. We decided to head back to the Grizzly. I had my camera with me, but only my super wide angle lens. Figured I would grab everything back at the coach and then return to Nye Beach to hang out with the rest of the unusual usuals. We got back to the coach, gathered our bits and headed back to Nye. It was about 3 pm and the water was now lapping the stern of the Little Linda. Not enough force to move her around, but enough to focus everyone’s attention on imagining that she moved. The Vietnam Vets all came out to see the Huey. All with stories about their experiences with this war bird or about someone they knew that flew one, crashed one or jumped out of one. Some were emotional as in brought back memories when they returned to a country that hated them. Some told stories about not admitting that they were Nam Vets until recently. After all, this day at Nye Beach was the first day of the 40th anniversary of Woodstock. There were a few welling eyes as they grouped together to tell their stories around the tail rotor of the Huey. We spent more time with Sean and Bob his crew chief. I could not help notice Sean’s arms. The underside looked like he had been resting his arms of a grate with thousands of circular dimples. You know, they looked like you have leaned on something with a bunch of holes and it created this perfect pattern on the skin that would soon disappear. Sean’s did not disappear and I looked for something that he might be leaning on to cause this funny looking design on both of his arms. The Little Linda moved a bit. That line that Sean had flown out was pulled in and the 4” line pulled out and secured to the tug. The radio blasted, “another 50 rpm’s.” The tug captain acknowledged and a puff of white smoke billowed out of the stack of the tug. Stationed about one quarter of a mile off shore, the tug pulled the heavy line tight. Keeping the line as tight as possible, they waited for the boot stripe of the Little Linda to be submerged. life raft. To their embarrassment, when they threw the life raft over and jumped in, they were in 6” deep water on the beach. Luckily, this all happened at 2 am and no one saw the seafaring screw-up. When everyone woke, it was just a new icon on Nye Beach. 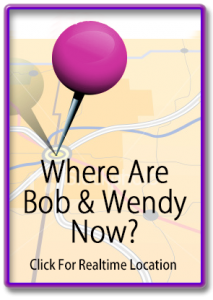 Wendy started to talk to Sean again as the Little Linda bobbled a bit in the surf. 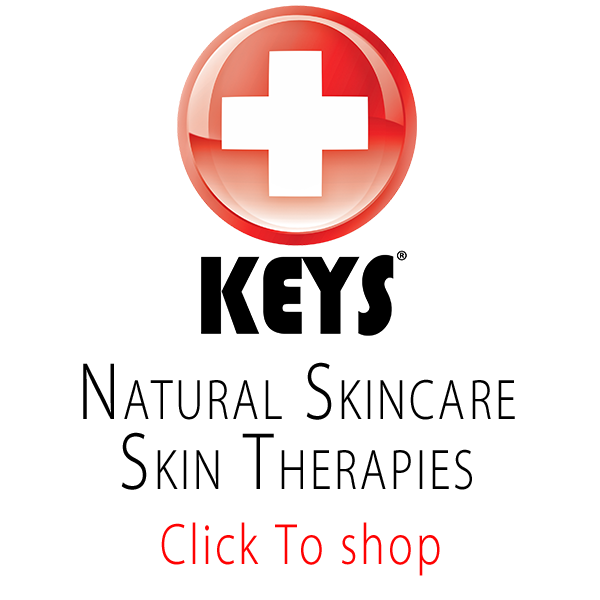 He asked what we did and she told him about our inside out skin care company that put us on the road 300+ days a year. He told her about the gallon of lotion that he used almost every day. She said why and he told her of a helicopter crash that left him burned over 40% of his body. Now those marks on his arms made sense. Skin grafts! He described that the hospital in Tennessee told him that it would take a year and a half of surgeries with animal skin grafts and countless hours of rehabilitation. Sean’s sister-in-law found a burn specialist in Portland and they flew Sean there. They took his own skin from his legs, perforated it and stretched it over his arms. As the new skin grew between the holes, it created this perfect geometric pattern on Sean’s arms. Now it looks great, but like giant goose bumps on his arms. Sean and Bob had done their work early in the day, but had to hang around until the salvage master released them. 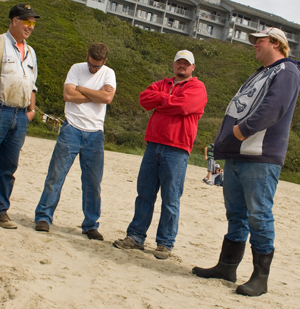 He wanted them to wait in case the crew on the Little Linda had to abandon ship in case she broke apart as they pulled her off the beach. They brought over a life ring and told them that if the Little Linda went down, they were to fly out and drag the life ring so that they crew could catch on and be drug back to shore. Sean had a puzzled look on his face as they handed him the ring. It was now about 4:30p and the water was up to the boot strip on the Little Linda. The radio rang out from the captain of the Little Linda to the tug, “another 50 rpm’s.” Again another puff of white smoke rose from the tug and the line was singing tight. The crowd was pretty large now. I had brought back a DVD for Sean with all the pictures that I had shot that morning. We were on the inside of the cordoned area looking out at what probably totaled 1,000 people all spread out over Nye Beach. Everyone was standing around now. 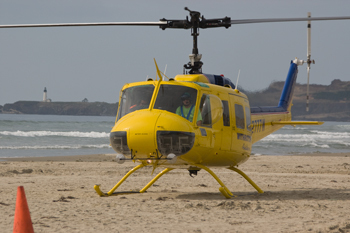 The Cat’s were up the beach now and Sean became a bit nervous that the water was getting close to the chopper. He figured that if he had to wait until 6pm that he was going to have to fly out with the skids in the water. 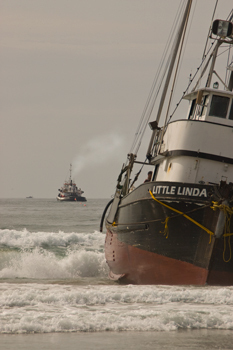 Just then, the Little Linda stood straight up from the 30° tilt that she had since being beached. She just stood straight up in the water as if proud. A few minutes later, we watched as the Little Linda hobby horsed on the beach. The tug kept her tight, so that she would not go on the beach anymore. Today, Nye Beach was supposed to have an 8’ positive tide. This was good for the Little Linda. Just then, the captain of Little Linda called for 5o more rpm’s. 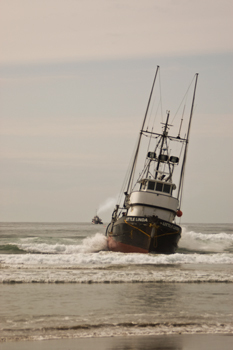 Again the white smoke poured from the Tug and the Little Linda moved backwards stern first into the surf. The crowd cheered and all the TV crews on the hill trained their cameras on the Little Linda to see if she would float and then make it through the surf. 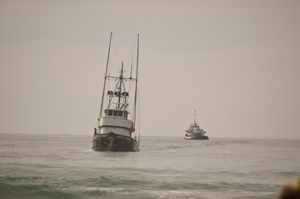 Little Linda was now about 50 yards off shore and floating as the tug pulled hard to get her free of the surf. The beach was now almost clear of people. The excitement was over and there was this sense that a community had come together to witness this event and to tell their stories. Now it was time to go back to their caves, businesses and unusual usual lifestyles. 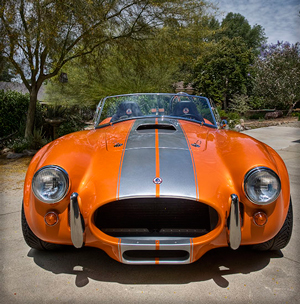 The Cat’s cruised down the beach and the Little Linda was barely a speck on the horizon. Sean radio blurted as the tug captain suggested to the Little Linda that she be renamed the Luck Linda. The last vehicle on the beach drove over toward Sean. The salvage master got out and told Sean he was fired. Sean raised his arms because it was now 5pm and he would be airborne and hour and a half early. We said our goodbyes to Sean and said we would send him some MetaCare and Tortuga for his burns. 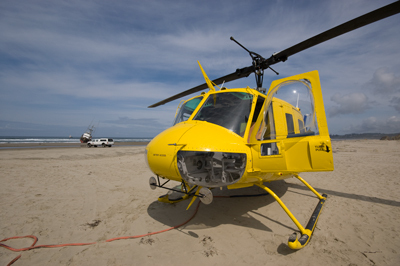 Last on the beach, the Huey was ready and fired the turbine. 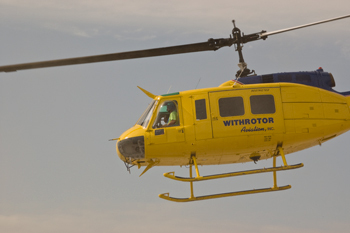 Sean waved at Wendy and gave me a smile as he slowly pulled the collective and the Huey rose into the sky. Headed home, we watched as Sean crossed the beach and headed for refuel in Corvallis before heading home to southern Oregon. We walked the half-mile back to Nye Beach common and talked of the interesting people we met and their wonderful stories. After all, everyone really does have a story if you take time to listen. We heard from Sean the next day. He emailed us his address so that we could send the samples. He said he enjoyed meeting us and that for the first time in a long time he was able to kick back and enjoy the scenery. Bob flew back home and Sean relaxed. on your passing day spent with Sean and many others,all curious as to the outcome. And a Yellow, Aged Huey yet !!!! Please keep it up. 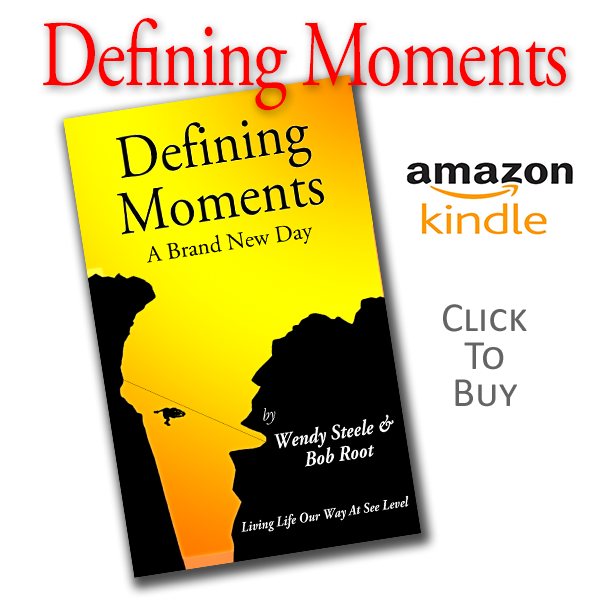 Don’t miss out on each and every day….because as you say… ” Things Just Seem To Happen ” , if you let them. And, in a relatively brief time, everything from speed boat launches,wandering Moose and even great pictures go along with it all! Disney dripping the Pacific Ocean is another classic!!! 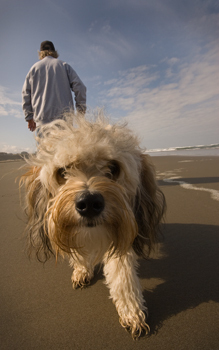 Chill Travelers » Blog Archive » Another Summer In Newport…Oregon That Is!